My littlest sister is a pretty proficient kitchen-ista (our other sister is the brownie/pumpkin muffin queen; her ability to bake any and everything into muffin cups can’t be touched). Every once in awhile she sends me a completely random photo of something she found a minute to prepare (though I have no idea when she finds the time between work and her status as a full time student). I have pictures of her pretty veggie-laden pasta salad and some chicken tortilla soup. Occassionally she shoots me a quick text message asking for an ingredient suggestion or bake time, and it thrills me to pieces everytime she does. When my littlest sister comes to visit, our time is always spent in the kitchen with a bottle of wine, lots of catching up, and some sort of meal concoction. Our foodie experimentation has yielded things like whole wheat white lasagna (all stuffed with spinach and greens and like 17 kinds of cheese), my infamous pumpkin cake (find a mini version of that here), or the small Mexican feast we shared before she left for France (where there is an apparrent lack of Mexican food). 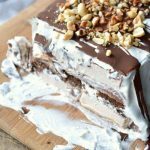 She and I have always enjoyed the same kinds of foods; we tend to seek out many of the same flavor combinations and love the creativity that playing in the kitchen can offer our palates. I received a short message from Littlest Sister the other day, and in it was a simple request: granola bars that stick together without peanut butter (for the record, I do not know what the opposition to peanut butter is because in my world it’s kind of like bacon or chocolate– it makes everything better). So I set to work trying to find granola bars with another kind of “glue”. I read 7,354 recipes for granola bars. Okay maybe it wasn’t quite that many, but it seemed like it. Healthy granola bars seem to be a logistical conundrum. When I read a recipe that claims to be healthy, I don’t expect to read an ingredient list boasting 2 cups of sugar. Or butter. Or a small boatload of salt. And since we were avoiding peanut butter, I decided to scrap the almond butter substitute option as well. After a serious granola bar education, I decided to forge ahead with very little guidance all by myself. I toasted oats in the oven and then coarsely chopped all the dried fruit I could find in the cupboard, which today was cranberries, apricots, and dates. 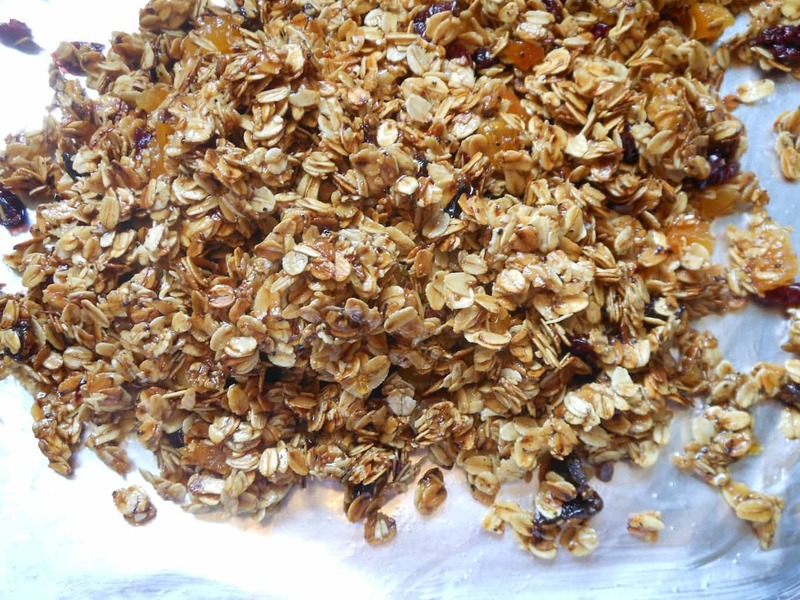 Stir it all together and dump everything onto a foil or parchment paper lined baking sheet with sides for thinner granola bars (shown here) and then press it out evenly. I find that bars with a little “chunk” stick together better. Granola bars that fall apart was my number one problem when I eliminated peanut butter. For a thicker, sturdier granola bar, press the mixture into a lined 8X8 pan. Using another piece of foil or parchment paper to lay over the top and Prrreeeesssss PRess PRESS down really hard to pack all the ingredients together. Let the bars cool completely (1-2 hours) before removing the foil and cutting them apart. 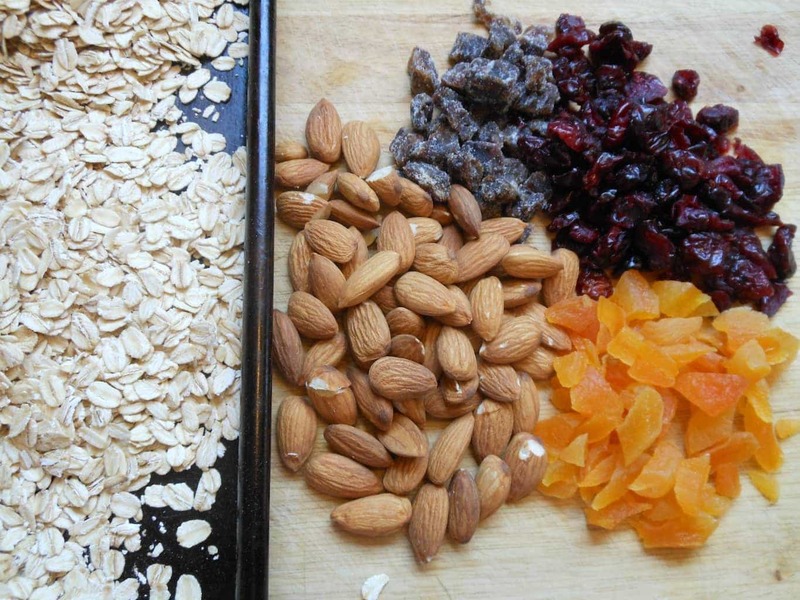 With a sharp knife cut the granola into bars. Wrap them in parchment paper individually so they won’t stick together and store in an airtight container. Spread the oats evenly onto an ungreased baking sheet and preheat the oven to 350. Bake the oats, stirring occasionally, for 10 minutes until they take on a nice toasty brown color. Pour the toasted oats into a large bowl. Line an 8X8 pan with foil or parchment paper. In a small sauce pan combine the brown sugar, honey, vanilla, and oil. Bring it to a slow boil over medium heat stirring frequently until the sugars are dissolved. Pour this mixture over the oats. 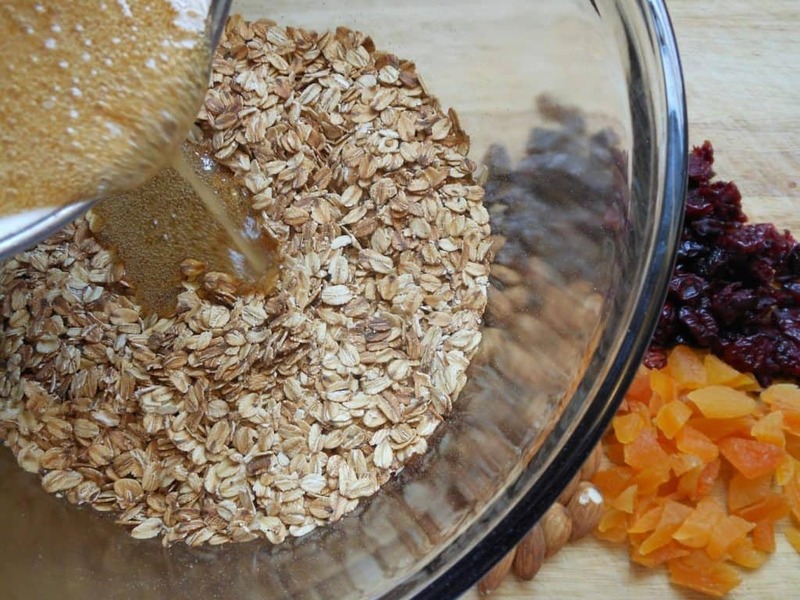 Add the dried fruit to the bowl with the oats and then stir everything together until it's evenly coated. Dump the contents of the bowl into the prepared pan and press firmly into place (wet hands help). 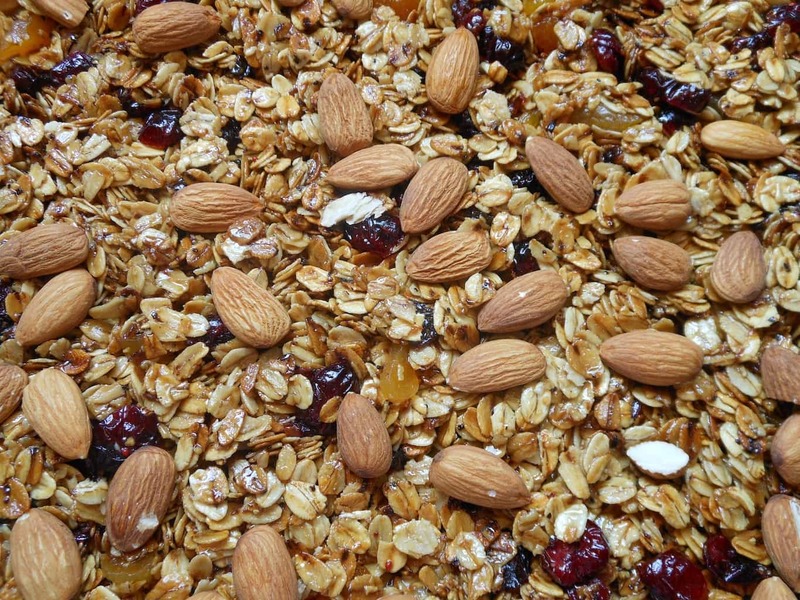 Scatter the almonds across the top of the granola and then lay a piece of foil or parchment paper over everything. Press, press, press everything into place. Leave the foil over the granola until it's completely cooled (1-2 hours), then remove the granola from the pan and cut into bars. Wrap individually and store in an airtight container. Let Them Eat (Cheese) Cake! 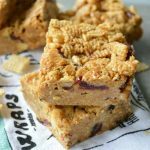 And I can totally relate – every muesli bar which was healthy had at least 1 cup sugar! I had to eventually make up my own with some butter, mashed banana, 2 tbs maple syrup etc! Oh thank you 🙂 I’ll have to go snag your recipe and add it to my arsenal! And yes, both of my sisters are awesome. I’m a lucky girl. When the boyfriend actually eats breakfast, it’s typically a breakfast burrito or bagel on the way to work- these were an attempt to inject fruit/nuts/whatever else into his mornings. Nothing against peanut butter- just wanted some variety. Yeah Chad gobbles up bacon or sausage egg and cheese on toast times two (sometimes three) EVERY morning. And there’s no changin it. So I send him granola bars and muffins and fruit for his break. Whatever works 🙂 You’re MY hero. Love you, too! I’m so glad you did all the recipe research for granola bars. I did the same with healthy protein bars, and so far, I’m not pleased with my results. These look simple and yummy! I love incorporating coconut oil, so I was glad to see it in your recipe. Must do list!! This looks awesome! My talented daughter! 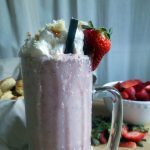 (one of three) Your concoctions work, and they are delicious! Spencer is after me to try many of your posts…we made the pineapple, broccoli chicken tonight….yummy. Thanks, Momma 🙂 Glad the chicken pineapple rice turned out. Spencer told me about the buffalo chicken macaroni- he was excited. Make these! They’re like no-bake less-guilty snack cookies. Oh I hope you will! Let me know how it goes! These look so yummy. 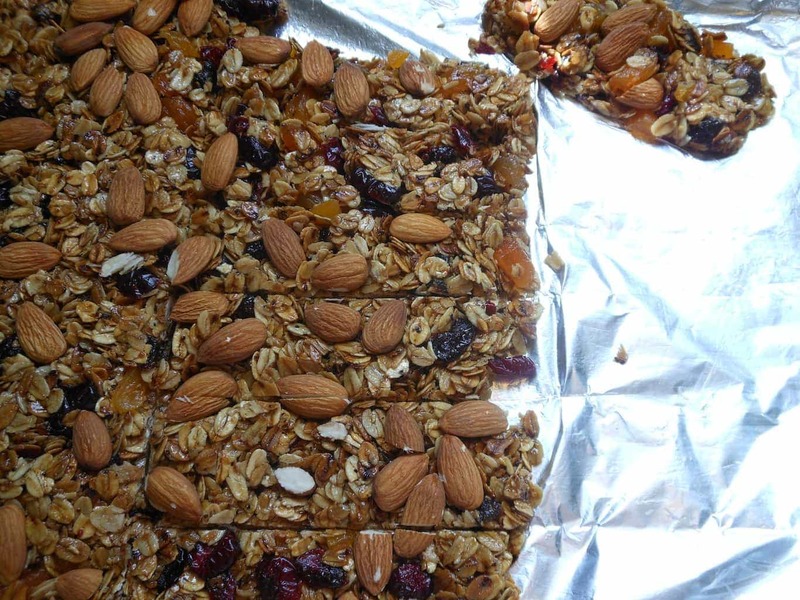 Love homemade granola bars…. Who am I kidding, I love all granola bars. Loved hearing about the relationship with your sister. Thank you! My sisters are awesome. And so are granola bars (even the Quaker Oats sugar-laden chewy chocolate chip variety, a staple of my youth). 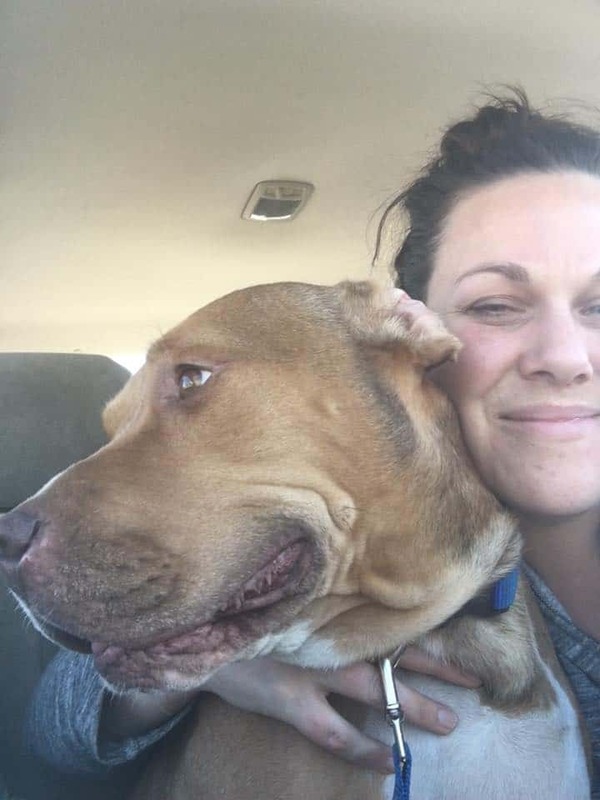 What an fantastic sister you are Heather. 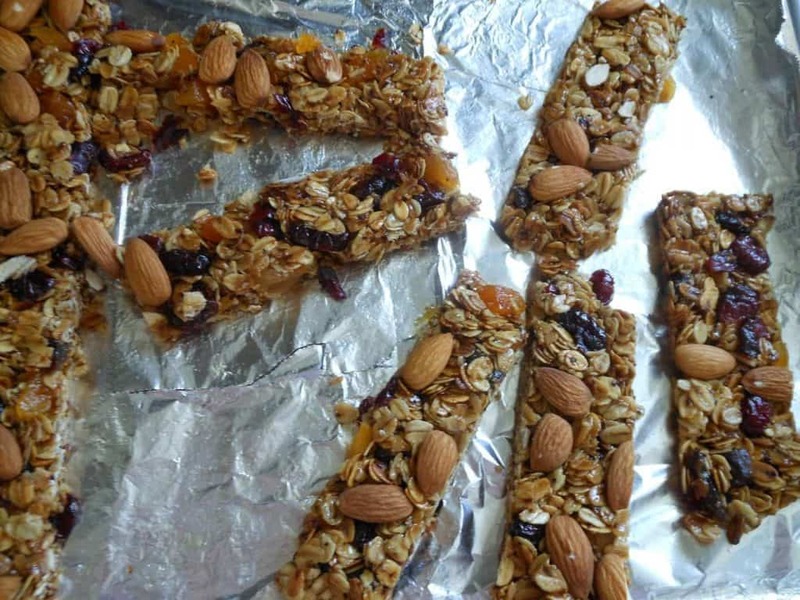 These granola bars look so good and sound extremely healthy. Saving this recipe for future use. Thanks, Tia! You’re so sweet. Hope you enjoy! I seriously prefer coconut oil. You are so sweet to your sister<3 Now we can all save money on what I think is one of the most eaten work snack. Seriously. It costs a little bit to initially stock a pantry well, but once it’s done, it barely costs at all to make anything. Granola bars included. I had everything in the cabinets that I needed! And coconut oil has been my new bff here lately. It will happily substitute in most things! Steel cut oats?! Really? The recipe looks like *just* what I’ve been trying to find for, oh, about the past 20 years! Thank you. Thanks for stopping by! Let me know how it works out! These look really good. I should stop eating my boys’ granola bars and make yours! 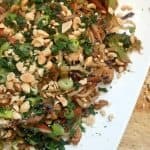 Thank you for all the research you did (whew, I hope it was done with glass of wine in hand) and for sharing your recipe. Loved hearing about your sister too. You both must have so much fun together!! These bars turned out amazing! I didn’t have dates or apricots, so I substituted peanuts, sunflower seeds, coconut and raisins. Thank you for this recipe. My husband and grandkids are loving them! I’m so glad you liked them Sandy! Your substitutions sound delicious! My favorite thing about these is how flexible they are — I have another recipe posted using this as a base and then dressing them up with chocolate. Yum! Thanks so much for the feedback! Hmm wow I pressed really hard. Like I literally lifted myself off the ground XD. Maybe I’ll try reducing the oil- yeah. 🙂 Thanks! By the way, does temperature make a difference? I also found that it was less sweet after I’d let it sit for a couple hours. Is this because the oats have absorbed the sugar/honey? I’m glad, though, because it was killer sweet at first, and I was so worried!